Turf diseases like brown patch or take-all-patch, if present, can be cured with cornmeal, compost or PureGro. The toxic chemical products don’t work. They kill the beneficial microbes more than the targeted pathogens. However, most current turf problems and other plant problems are related to the heat and the irrigation techniques. How often should you be watering now? I don’t know - it depends on your location, the soil, plant types, organic or synthetic program, etc. Hopefully you are organic and thus have lower water needs. First, turn the irrigation control off automatic and on to manual. Then the system won't run unless you push the button. You’ll save lots of water, the soil will be healthier, and your landscaping will look better. This is as much a no-brainer as not catching the grass clippings in order to feed the beneficial microbes. Water deeply and infrequently as possible so that the soil pulses or breathes. About 1" of water per week in the summer is a good starting point. Then adjust from there. Light, frequent watering of grass and other plants produces a weak, shallow root system that encourages weed invasion and does not effectively use soil nutrients and moisture. Ideally, it is best to water any turf just before it begins to wilt. Early morning is usually the best time of day - late afternoon is the worst. Morning is when wind is lowest and there will be less waste through evaporation. It is the coolest part of the day and provides water during the heat of the day. Go organic. The single most effective way to save water is to go organic. Healthy plants in healthy soil have large amounts of beneficial fungi that basically expand the root system to be more efficient at accessing water and nutrients. Plant adapted plants - natives are best. Use compost, earthworm castings, organic fertilizer and dry molasses. Avoid synthetic fertilizers and toxic chemical pesticides. Add volcanic rock minerals - i.e. lava sand, zeolite, basalt, etc. Mulch all bare soil with shredded native tree trimmings. Water at night or very early morning for best results. No that doesn’t encourage disease - it rains at night. Be careful of drip irrigation. Water has a habit of seeking the path of least resistance. The result can be wet and dry spots. Above ground sprinkling is usually best. Use compost, volcanic rock sands, organic fertilizer and molasses. Avoid synthetic fertilizers and toxic chemical pesticides. Again, the most important point of all is to use an organic program. 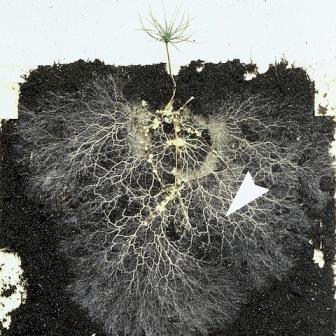 Healthy soil contains bacteria and other beneficial microbes that hold water very efficiently, and the roots of plants in healthy soil are greatly expanded by the growth of mycorrhizal fungi. It’s all as nature intended. Corporate headquarters, golf courses, commercial and residential landscapes, and public gardens can save about 40-50% on water use and related costs by using an organic program. See the following success stories: Organic Golf Courses: Texas Tech and Tierra Verde. Public Garden: Bayou Bend. News Story: The Grass is Greener at Harvard.